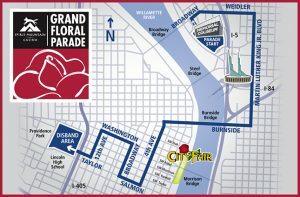 Let TriMet whisk you to witness the jewel of Portland’s Rose Festival – The Grand Floral Parade – on Saturday, June 9. 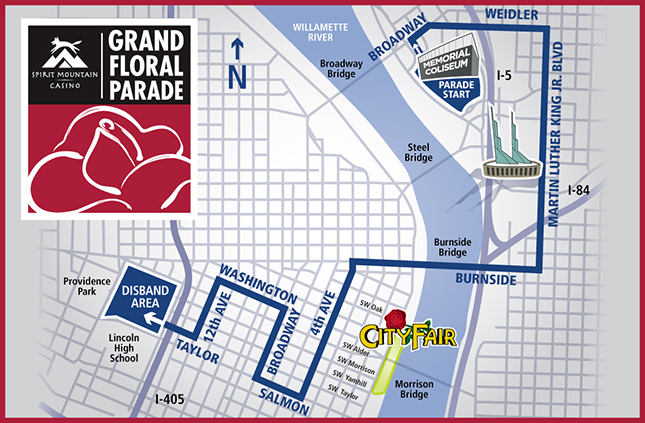 After the Grand Floral walk begins at 9:30 a.m., the parade winds its way through the streets of Portland City Center from 10 a.m. to 2 p.m. and we’re ready to get you to the festivities. Plan ahead and be patient as Rose Festival parade days are typically TriMet’s busiest days of the year. We’ll have staff out and about to help you navigate to, through and back home from the parade. Head to Downtown Portland early. Arrive before the Grand Floral Parade is under way. The parade crosses MAX lines and some bus routes, which will lead to some delays. Check trimet.org/alerts before traveling. All buses and MAX will run on regular Saturday schedules. Taking MAX? Plan an extra 30 minutes for all MAX trips as trains system wide may stop at stations for a few minutes while trains in Portland City Center are held at times during the parade. Riding bus? Plan an extra 15-30 minutes for trips that run on bus lines through downtown. Twelve bus lines intersect the parade route and will be detoured. Lines 4, 12, 15, 16, 17, 19, 20, 35, 44 and 54/56 will be detoured from the start of service. Line 6 will be detoured starting about 7:30 a.m.
Fares are required on all TriMet vehicles. Pick up a Hop Fastpass™ card from one of hundreds of local retailers, load value on it and use it to ride. No card? No problem. Use Apple Pay, Google Pay or Samsung Pay to purchase an adult fare instantly using your mobile wallet! Android users also have the option of using a virtual Hop card in Google Pay for adult, honored citizen or youth fare, and will get the same benefits of a plastic Hop card. TriMet wants you to have fun and stay safe during the Grand Floral Parade. Our operators will be watching out for you, but please be aware around our buses and trains. Also, always pay attention to your surroundings and your possessions, and if you see something suspicious, say something. Alert a TriMet employee, a police officer, a Rose Festival staff member or call 9-1-1 (text 9-1-1 if unable to make a voice call).